So, I must say, that of all the work, of all the planning, of all the to-dos, and “did you call so & so back?”, and “where should this piece of furniture go?” discussions and countless decisions, I can honestly say that settling on a paint color for my walls in my new home was the one I agonized the most over. I guess it’s that I have lived in a white-walled, blank canvas rental situation for so very long that I was so excited about the opportunity to paint and therefore, the pressure! I knew the color scheme and the feel that I wanted when I walked into my home, but deciding on that perfect shade and hue was harder than I thought. I looked through hundreds of Benjamin Moore paint swatches and blog posts and Pinterest pins before settling on a few lovely colors for this first home. But first, the before pictures. Here we are standing in my dining room, looking back into the living room and to the front entryway & front door. The golden-hued living room in all its glory. **Side note: Please forgive the admittedly amateur nature of these BEFORE photos. It was just about dusk, so we didn’t have a lot of natural light coming in, and most of the house’s lighting had been removed, obviously, with the previous owner. Pay no attention to that woman in the mirror… she just loves this little house and can’t stop photographing it. Do you spot those precious little shutters going into the master bath? Those were the original shutter doors downstairs going from dining room to kitchen that the previous owner re-purposed. I love when things that are original to a house, stay in the house, but in a new and different way. Such a character piece for me! So yes, as you can see, the previous owner did swipe the mirrors in both the guest bath and the downstairs powder room (still to be shown), so not too thrilled with that and the splotches left on the walls, but know that I will be thrilled with the finished product once we re-sheet rock and paint over this damage. Ready to hang another mirror of my choosing. A brief stop here on the landing with the entrance to the master on my right and the guest bedroom on the left. At the foot of the steps you will see a large coat closet and not pictured, but is directly behind me, is a large linen closet perfect for storing extra pillows, blankets, my down comforter for winter nights, and much, more more. Which means, there is plenty of room for overnight guests. I wanted a simple shot of my front door, as it too will undergo a dramatic transformation! Plus, I wanted to show you another precious character piece for me with this house…. the Mail Slot! So retro and I absolutely love it! Above is the little downstairs 1/2 bath & powder room that is directly off the front entry way. It’s a small little room, but perfectly functional! There are a pair of lovely French doors off the dining room to my gated little patio out back. It’s so charming. And then my kitchen complete with colorful back splash, natural wood finished cabinets, and stainless steel appliances. Plus a few dozen tote bags that Mom and I inevitably come with each time we visit. So, there you have it! My little house was quite colorful before. The previous owner loved color and a lot of it, and I appreciate her for it. I like someone who knows what he/she likes and trusts their gut. But, as for me? I love cohesiveness and big blocks of color rather than choppy room-to-room color changes. One color just naturally flows into the next, flows into the next. I feel like my house looked smaller than it really was and I wanted to make the space feel more open, the rooms feel bigger, and the ceilings feel even higher. In order to achieve that, we painted the walls, the trim, the ceilings, and even the cabinets all one fabulous color. I am absolutely in love with this hue. I knew I wanted to go with a shade of gray. Not too light, and not too dark. 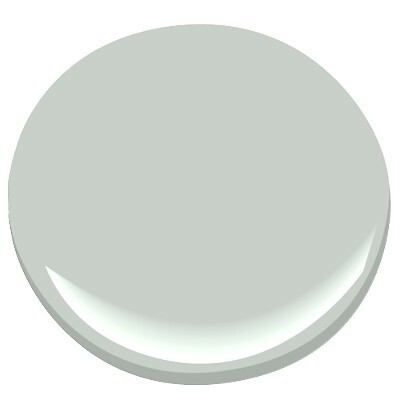 It’s a true gray, not too blue or too brown, and is a rich and inviting hue. To me, it just feels comfortable and warm and inviting. And I felt that it was the perfect backdrop for all my furniture and artwork. I am absolutely in LOVE with my kitchen now. Painting the cabinets made the biggest difference! Mom likes the cabinets too. For subtle pops of color, we decided to paint the french doors and the back of my front door a different, slightly darker shade than the walls. I think it makes for a nice focal point and your eyes are immediately drawn to it. And my eyes go immediately to the back of my front door. To me, it is the ultimate. For this task, I went with Chelsea Gray, also by Benjamin Moore. And it’s Postcards from the Ridge’s favorite paint color too! Quiet Moments by Benjamin Moore. I had seen this subtle blue-green-gray color in my friend Mary Alison’s house when I delivered dinner to her after her baby was born, and I fell in love with it! It’s sort of reminiscent of beach glass. It’s the perfect shade and is so calming and soothing. I mean, who doesn’t want “quiet moments” in their bedroom? Guest Room & Guest Bath. And here we are in the Master. Please excuse the wood shelving and wire racks in the center of the floor. These pictures were pre-Trash pick-up day. In the bathrooms, I wanted them to be crisp and clean, so I went with white on both the walls and cabinetry. But, it couldn’t just be any white. 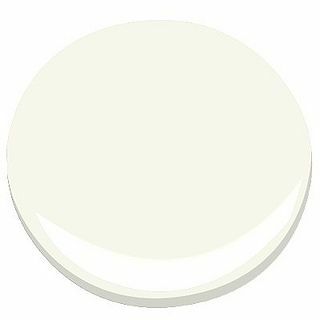 Simply White, by Benjamin Moore. Subtle and perfectly glossy. I love this shade of white. Just wanted the space to be very clean and simple and fresh! I think the result is stunning and looks and feels exactly like me and the space that I call home. So excited to move my things in! And because here I was standing in my new master bedroom & bathroom, I thought this was an appropriate occasion for my very first Bathroom Selfie! So, the last to-dos are being checked off the list as I type. New carpet is going down and then the real work begins… Moving. Can’t wait to share with you the finished product. But, it may be a week or 2. I have decided that “getting settled” is a difficult endeavor indeed. But, a worthwhile one. 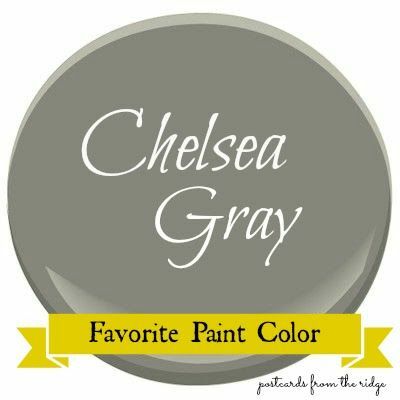 Love all the painting…the Chelsea gray is beautiful! Maggie, that just about might be my very favorite part!! I wish all your readers had the chance to walk through the before to really appreciate the beautiful after! I cannot wait to see it when you are moved IN!!! Thank you Kim! I agree. The change is dramatic, to say the least. We are in and feeling more and more settled each day. Feel really blessed and cozy in this little house of mine! Can’t wait for you to see it!